Viking Books for Young Readers, 9780670016365, 40pp. On a cold night, under a pale moon, a brother and sister explore a dark, dark cave. Strange creatures skitter along the walls while bats brush past. A wild howl makes the cave feel just a teensy bit darker. But readers are in for a delightful surprise when a beam of light reveals a softer side of the cave. 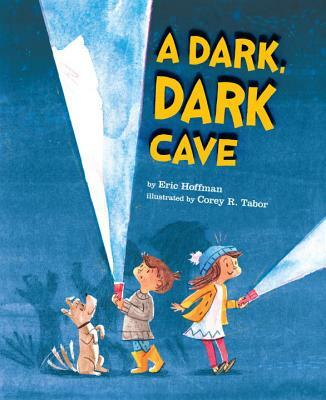 Told in spare rhyming text alongside stunning illustrations, A Dark, Dark Cave will ignite a young reader's imagination and inspire creative play. This just-spooky-enough story is sure to become a read-aloud favorite. Eric Hoffman has worked for thirty-five years in Maryland, Ohio, and California helping preschoolers create caves, forts, nests, barns, and other hideouts. He lives and writes in a sunny house in Santa Cruz. "This joyful, timeless exploration of play is sure to be an inspirational spark to young readers, who will then embark on their own imaginary games. Readers young and old will find much to appreciate in this celebration of the imagination." "Wonderfully expressive multimedia illustrations add depth and vitality to the suspenseful text… Build your own fort in which to enjoy this imaginative portrayal of a sweet sibling adventure." "For fans of imaginative play."